Aye was known as ‘Divine Father’. He was the husband of Queen Nefertiti’s nurse. Among his many titles was ‘Overseer of All the Horses of His Majesty’. He was Akhenaten’s close friend and adviser, a role he continued with the young pharaoh Tutankhamon. When Tel el Amarna was abandoned after Akhenaten’s death, Aye’s tomb was incomplete. 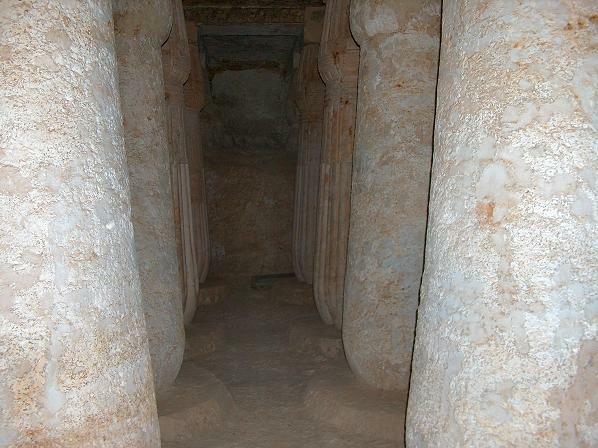 It is clear, however, that it was planned to be one of the most imposing on the necropolis. The representations on the entrance doorposts, the entrance to the main chamber and on the four completed columns (of the twenty-four originally intended in the main hall) are of Akhenaten, Nefertiti and the royal children, as well as Aye and Ti, his wife, praying to the Aten. 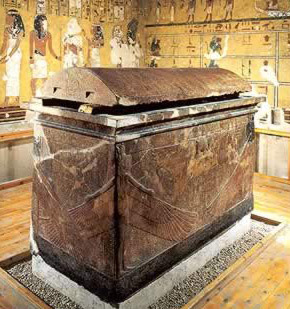 It was in this tomb that the most complete version of the Hymn to the Sun (page 117) was found. It was inscribed on the right-hand side of the entrance doorway. The most noteworthy scene is to be found to the left of the entrance doorway. Though damaged, it is a vivid and detailed scene showing gold chains and decorations being thrown from the window of the palace by Akhenaten and Nefertiti to Aye and his wife Ti. Beside Nefertiti are three princesses, one of whom affectionately touches her mother’s chin. In the upper register are sentries. In the palace courtyard are chariots, scribes, fan-bearers, soldiers, visitors and dancers. The officials either bend in respect or raise their hands in homage to the royal family. Aye himself emerges from the palace (to the right), and his retainers and friends congratulate him for the honours paid him.